In order to test the hypothesis that inhaled nitric oxide (NO) reverses the pulmonary hypertension induced by αα-diaspirin crosslinked hemoglobin (ααHb), were studied anesthetized pigs that were administered with a total dose of 200 mg/kg of 10% ααHb. Inhaled NO (5 ppm) was administered for 10 min, and then discontinued for 10 min. This cycle was then repeated with 10 ppm inhaled NO. ααHb caused pulmonary arterial pressure (PAP) to increase from 27 ± 1.7 to 40 ± 3.0 mmHg (P<0.05) and dynamic lung compliance to decrease from 29± 1.5 to 23± 1.6 ml/cmH2O (P < 0.05). After both doses of inhaled NO, but particularly 10 ppm, PAP was reduced (P < 0.05) and lung compliance increased (P < 0.05) from the ααHb levels. When inhaled NO was discontinued PAP again increased and lung compliance decreased to levels significantly different from baseline (P < 0.05). We conclude that cell-free hemoglobin-induced pulmonary hypertension and decreased lung compliance can be selectively counteracted by inhaled NO. Cell-free hemoglobin oxygen-carrying solutions are now undergoing clinical trials. Such solutions may overcome the limitations of homologous blood transfusion. Preservation of cardiovascular function and oxygen transport has been demonstrated after partial and complete exchange transfusion with cell-free hemoglobin solutions [1,2,3,4]. Hemoglobin solutions may have potential particularly as a resuscitative fluid due to their pharmacological actions, which cause increases in arterial pressure and blood flow even in small doses [5,6]. However, it has been demonstrated that pulmonary hypertension, leading to hypoxemia and hemodynamic instability, may offset the benefits of cell-free hemoglobin blood substitutes [7,8,9,10,11]. The main mechanism by which these solutions produce vasoconstriction is by binding and inactivating nitric oxide (NO) [12,13,14], a key mediator responsible for the physiological regulation of the vasodilatory tone. Selective pulmonary vasodilation with inhaled NO administration has been widely demonstrated in animal models and in patients with pulmonary hypertension [15,16,17].Selective pulmonary vasodilation occurs because inhaled NO is rapidly inactivated by hemoglobin as it enters the circulation; hemoglobin's affinity for NO is many thousand times greater than for either oxygen or carbon monoxide [18,19,20]. It has also been shown that inhaled NO can attenuate bronchoconstriction [21,22]. We are unaware of any evaluation of the effects of cell-free hemoglobin on lung compliance and airway resistance. We hypothesized that inhaled NO will selectively counteract the pulmonary hypertension induced by cell-free hemoglobin blood substitutes. To test our hypothesis we performed experiments in pigs administered with inhaled NO after αα-diaspirin crosslinked hemoglobin (ααHb) infusion. We also evaluated the effects of ααHb on dynamic lung compliance and airway resistance, and the response of these parameters to inhaled NO. Our preliminary results demonstrated that cell-free hemoglobin-induced pulmonary hypertension and decreased lung compliance can be selectively counteracted by inhaled NO. The study was performed using five immature female Yorkshire pigs, weighing 28.6 ± 0.6kg. The experimental protocol was reviewed and approved by the Animal Care and Use Committee of the University of Texas Medical Branch at Galveston, with adherence to National Institutes of Health guidelines for the care and use of laboratory animals (DDHS Publication, NIH, 86–23). The animals were fasted for 12 h before the study, with free access to water. Anesthesia was induced with an intramusclar injection of ketamine hydrochloride (10 mg/kg), atropine sulfate (0.04 mg/kg) and by inhalation of 5% isoflurane. After endotracheal intubation, an intravenous bolus of pancuronium bromide (0.08 mg/kg) and fentanyl (30 μ g/kg) was administered. Anesthesia was then maintained with a continuous infusion of fentanyl (5 μ g/kg/min). The volume and rate of the ventilator (Servo 900C, Siemens-Elema AB, Solna, Sweden) were set to maintain arterial CO2 tension at 35–40 mmHg, using the assist control mode an I:E ratio maintained at 1:3. An inspired oxygen fraction of 0.95 was used throughout the experiment, which maintained an arterial oxygen tension of between 400 and 450 mmHg and an arterial oxygen saturation > 97%. Core body temperature was maintained with a heating pad and warming lights. Polyethylene cannulas were inserted into the abdominal aorta through the right femoral artery for continuous recording of aortic blood pressure, heart rate and arterial blood sampling for blood gas analysis, and into the inferior vena cava through the right femoral vein for infusion of anesthetic agents, αα Hb and maintenance fluid (lactated Ringer's solution; 5 ml/kg/h). A 7.5-F flow-directed thermodiultion fiberoptic pulmonary artery catheter (Opticath P7110, Abbott Critical Care Systems, Mountain View, CA, USA) was guided by pressure monitoring and wave tracings through the right external jugular vein and the tip placed into the pulmonary artery. This catheter was used for measurement of pulmonary arterial pressure, continuous mixed venous oxyhemoglobin saturation (SvO2), and cardiac output by thermodilution (Oximetric 3 SO2/CO computer, Abbott, Chicago, IL, USA). Each catheter was connected to a pressures transducer (Transpac Disposable Transducer, Abbott) and to a Biopac Data Acquistion System (Model MP100, Biopac Systems, Goleta, CA, USA) for continuous recording of heart rate, systemic and pulmonary arterial pressures, and waveforms. Blood samples and methemoglobin levels were analyzed by a pH/Blood Gas Analyzer 1303 and CO-Oximeter 482 (Instrumentation Laboratory, Lexington, MA, USA). The ααHb used in this study was derived from outdated human blood and prepared according to previously published methods [10,23]. ααHb is crosslinked between the alpha subunits at α-Lys99 and bis-(3,5-dibromosalicyl) fumarate. The ααHb solution had a hemoglobin content of 10 g/dl, an osmolality of 300 mOsm/l, an oncotic pressure of 42 mmHg, a P50 (PaO2 at which 50% of hemoglobin is saturated with oxygen) of 29 mmHg and had ≤ 4% of its hemoglobin in the form of methemoglobin. It was provided through a Cooperative Research & Development Agreement with the Blood Research Detachment of the Walter Reed Army Institute of Research. The NO (800 ppm in nitrogen) was titrated using a 3500HL blender (Sechrist Industries, Anaheim, CA, USA) with compressed air as the mixing gas. The diluted gas was then connected to the air side of the blender on the Servo 900C. The gas was titrated to achieve concentrations of 5 ppm and 10 ppm with 95% oxygen. The inhaled NO concentration was confirmed using an electrochemical sensor (Pulmonox II NO-NO2 analyzer, Pulmonox Medical Corp, Tofield, Alberta, Canada). After a 30-min period of stabilization following surgical preparation, baseline data were obtained. αα Hb was administered in cumulative doses of 0.1, 0.5, 1.0 and 2.0 ml/kg, in 5-min intervals to a total dose of 2ml/kg (=200 mg/kg ααHb); the data were collected 10 min after the final ααHb infusion. Inhaled NO, in concentration of 5 ppm, was then administered for 10 min and data were recorded. The inhaled NO was discontinued for 10 min, after which data were again recorded. This cycle was repeated with 10 ppm inhaled NO. After the final measurements the animals were killed with an anesthetic overdose and saturated potassium chloride solution. Mean arterial pressure (MAP), mean pulmonary arterial pressure (PAP) central venous pressure (CVP), heart rate and SvO2 were continuously monitored; pulmonary artery occlusion pressure (PAOP) was measured in 5 min intervals. Cardiac output was determined by the thermodilution technique and is presented as cardiac index determined using calculated body surface area. Systemic and pulmonary vascular resistance indices (SVRI and PVRI, respectively) were calculated using standard formulae. Lung compliance (ml/cm H2O) = change in volume/(peak pressure-PEEP). Airway resistance (cmH2O/I/s) = alveolar pressure/(peak expiratory flow/60). End expiratory pressure (minus PEEP) is used as the alveolar pressure and is measured at the proximal end of the endotracheal tube. Firstly, data were recorded at baseline (BL) and 10 min after 200 mg/kg ααHb infusion (ααHb). Data were then recorded at the end of each of the following 10-min periods: inhaled NO at 5 ppm (NO 5 ppm), NO discontinued (OFF), inhaled NO at 10 ppm (NO 10 ppm), NO discontinued (OFF). Data were analyzed using analysis of variance for a single-factor experiment with repeated measures on time points (baseline, ααHb, NO 5 ppm, OFF, NO 10 ppm, OFF). Fisher's least significant difference procedure was used for multiple comparisons, with Bonferroni adjustment for number of comparisons. For all tests P < 0.05 was considered significant. Infusion of ααHb caused a significant increase of approximately 50% in PAP (Fig 1) while significant decreases in SvO2 and heart rate were observed (14% and 17% respectively) (Table 1). Increases in MAP, CVP, PAOP, PVRI and SVRI were observed after ααHb while cardiac index was slightly reduced; none of these changes were statistically significant (Table 1). Dynamic lung compliance showed a 22% reduction (P < 0.05) while airway resistance increased 14% (not significant) after ααHb infusion (Fig 2). Inhaled NO at both concentrations, but particularly 10 ppm, ameliorated the ααHb-induced changes in PAP and lung compliance (Figs 1 and 2), while only modest changes in the other variables were observed (Fig 2,Table 1). After inhaled NO 5 ppm, PAP was significantly reduced (P < 0.05) from ααHb levels, but was slightly higher than baseline (not significant). When inhaled NO was discontinued, PAP increased to values higher than baseline (P < 0.05), but not significantly different than levels during inhaled NO 5 ppm. Inhaled NO 10 ppm reduced PAP (P < 0.05) to baseline values, but after NO discontinuation PAP returned to values that were significantly higher than baseline (Fig 1). 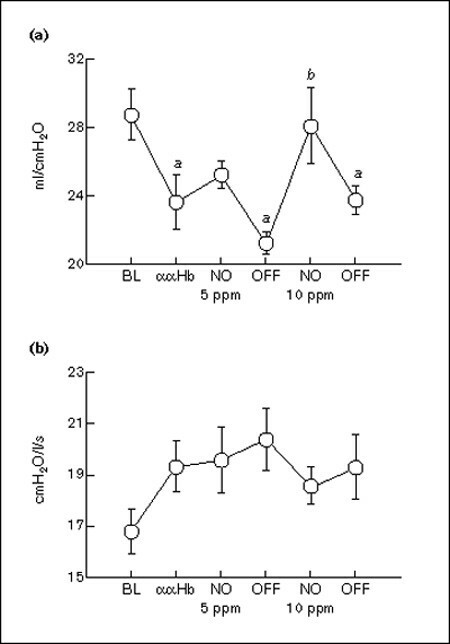 Lung compliance, which was markedly reduced by ααHb, showed a modest rise with inhaled NO 5 ppm, while a substantial increase (P < 0.05) was observed after inhaled NO 10 ppm (Fig 2). When inhaled NO was discontinued, lung compliance returned to levels lower than baseline (P < 0.05). On the other hand, airway resistance showed no significant changes throughout the experiment. The other variables showed no significant changes after either NO inhalation or discontinuation, except for cardiac index, which was significantly lower than baseline only at the final measurement and for both SVRI and PVRI, which were higher than baseline (P < 0.05) when inhaled NO was discontinued (Table 1). Mean pulmonary arterial pressure. BL = basline; ααHb = αα-crosslinked hemoglobin 200 mg/kg; NO 5 ppm = 5 ppm inhaled nitric oxide; OFF = nitric oxide discontinued; NO 10 ppm = 10 ppm inhaled nitric oxide. a P < 0.05 compared to baseline; b P < 0.05 compared to ααHb; c P < 0.05 compared to OFF. (a) Lung compliance and (b) airway resistance. 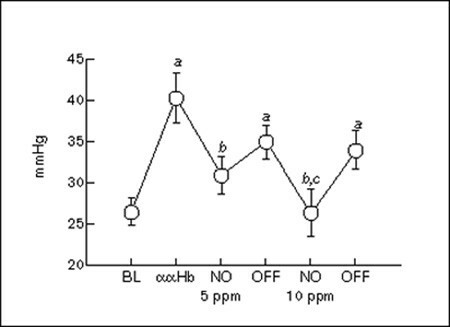 BL = baseline; ααHb = αα-crosslinked hemoglobin 200 mg/kg; NO 5 ppm = 5 ppm inhaled nitric oxide; NO 10 ppm = 10 ppm inhaled nitric oxide; OFF = nitric oxide discontinued. a P < 0.05 compared to baseline; b P #60; 0.05 compared to ααHb. ααHb: αα-crosslinked hemoglobin 200 mg/kg; NO 5ppm = 5ppm inhaled nitric oxide; NO 10 ppm = 10 ppm inhaled nitric oxide; OFF = nitric oxide discontinued; MAP = mean arterial pressure; CVP = central venous pressure; PAOP = pulmonary artery occlusion pressure; HR = heart rate; CI = cardiac index; SVRI = systemic vascular resistance index; PVRI = pulmonary vasclar resistance index; SvO2 = mixed venous oxygen saturation *P<0.05 compared to baseline. We demonstrated that inhaled NO can selectively reverse the pulmonary hypertension and decreased lung compliance induced by cell-free hemoglobin. This suggests that its is possible to effectively control potentially deleterious side-effects associated with the clinical use of cell-free hemoglobin-based blood substitutes. Pulmonary hypertension after cell-free hemoglobin solutions has also been reported by other investigators using animal models of exchange transfusion, hemodilutin, sepsis and hemorrhagic shock [7,8,9,10,11]. In a previous study of hemorrhaged pigs we showed that, although arterial pressure and brain blood flow were restored to prehemorrhage values after small volume (4 ml/kg) infusion of ααHb, a two-fold increase in pulmonary pressure and a four-fold increase in pulmonary vascular resistance were undesirable side-effects . In a subsequent similar study in which ααHb was used concomitantly with systemic vasodilators, pulmonary pressure transistenly equalized systemic pressures, leading to marked hemodynamic instability in two out of six pigs . Cell-free hemoglobin produces its vasopressor effect primarily by binding and scavenging NO [12,13,14], although release of endothelin and other vasoconstrictors may play a role. When hemoglobin is within the red blood cells, NO is removed as it dissolves into the plasma and ultimately interacts with hemoglobin. When hemoglobin is free in solution, NO is inactivated to a greater extent, thereby causing vasoconstriction [18,19]. These properties of cell-free hemoglobin have suggested its use as treatment for conditions associated with excessive NO production, such as sepsis-induced hypotension and low systemic vascular resistance [24,25]. However, cell-free hemoglobin caused a significant exacerbation of endotoxin-induced pulmonary hypertension and arterial hypoxemia in endotoxemic pigs . Hypoxemia, respiratory acidosis and ventilation-perfusion abnormalities were observed in a canine model of bacteremia after cell-free hemoglobin infusion . We have demonstrated in this study that dynamic lung compliance is significantly decreased by cell-free hemoglobin, a finding that may explain in part some of the ventilatory problems described in septic animal models [9,26]. Inhaled NO, particularly at a dose of 10 ppm, completely restored lung compliance. This benefit was observed without significant changes occurring in airway resistance, although a bronchodilatory effect has been previously ascribed to inhaled NO [21,22]. The mechanism involved in hemoglobin-induced decreases in lung compliance is not known. Previous studies have documented that inhaled NO has a predominant vasodilating effect on the pulmonary venous vasculature, thereby lowering the pulmonary capillary pressure and reducing fluid filtration in the lung . It has been shown that the inhibition of NO production by L-nitro arginine methyl ester (L-NAME) caused a higher contraction in pulmonary veins than in pulmonary arteries in isolated vessels from septic sheep . Therefore, it is tempting to speculate that inhibition of NO by cell-free hemoglobin with subsequent venoconstriction and increased capillary pressure may increase extravascular lung water, contributing to the decreased lung compliance. Surprisingly, human studies evaluating the safety of hemoglobin-based blood substitutes do not appear to directly address the potentially dangerous side-effects of pulmonary hypertension and decreased lung compliance. One study, presented as an abstract , in which a very small dose of cell-free hemoglobin (50 mg/kg) was infused to 11 anesthetized patients showed that mean PAP increased from 21 to 27 mmHg, measured 30 min after infusion. This finding illustrates the potential for adverse effects in humans, particularly in patients with pre-existing diseases and limited cardiac and pulmonary function. On the other hand, hundreds of patients have been tested and safety is claimed with most hemoglobin-based blood substitutes. Unfortunately only limited data are available in the peer-reviewed literature, making it difficult to correlate the concerns raised in this study suggests that it will be an effective approach to selectively counteract the undesirable side-effects of hemoglobin solutions in the pulmonary circulation. Although caution should be exercised when drawing clinical implications from animal studies, the pig is usually considered an appropriate animal model because of its anatomical and physiological similarities to humans, particularly regarding the heart and lungs. Prospective clinical studies addressing pulmonary pressures and right ventricle performance are needed; complete hemodynamic evaluation should be performed in the ongoing blood substitute trials, as this is the only means to determine whether concerns raised by animal studies are clinically relevant. The limitations of our study, which include a small sample size, no control group and short experimental period, resulted from a small supply of the hemoglobin. However, were clearly demonstrated the potential for inhaled NO to modulate the increased PAP and decreased lung compliance without major effects in the systemic circulation. We conclude that inhaled No selectively reverses pulmonary hypertension and decreased lung compliance induced by cell-free hemoglobin blood substitutes. The authors thank Tatsuo Uchida for statistical analysis and the US Army for providing the αα -hemoglobin used in this study. The study was performed at the Department of Anesthesiology, University of Texas Medical Branch, Galveston, TX, USA. Luiz F Poli de Figueiredo was a Visiting Assistant Professor at University of Texas Medical Branch during these experiments, with a sponsorship by Fundação de Apoio a Pesquisa Estado de São Paulo, FAPESP-Brazil, Grant 93/3796-5.